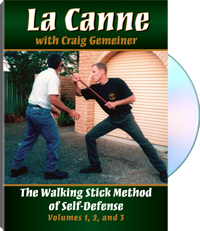 In Volume 1, La Canne and savate expert Craig Gemeiner reveals the long-lost secrets of this amazing art and presents detailed instruction in its fundamental skills. Gemeiner's training regimen covers all the basic elements of this combat method, including weapon selection, proper grip, stance and footwork, guard positions, defensive tactics, single strikes, striking combinations, solo and partner training drills and full-speed, full-contact sparring. Craig Gemeiner is the founder of the Gemeiner Martial Arts Academy in Queensland, Australia, and one of the foremost instructors of Street Savate, sport-style savate, fencing and savate weaponry in Australia. He is also a researcher and historian of the European combat arts and has been a pioneer in the process of rediscovering Europe's traditional self-defense arts and adapting them to modern use. For more information, consult Gemeiner's website.